There are three compelling reasons to put a new Leica C in your pocket or purse. Built-In Electronic Viewfinder: where every Leica owner expects it to be. Size: Shorter than an iPhone (about twice the thickness), you’ll take it everywhere. WiFi: Control the camera from your smartphone and send images online. Images: The pictures look great. Color, contrast, dynamic range and resolution are excellent. See some examples in the next post. Well, that’s four good reasons to be lusting after the new Leica C, and there are many more. 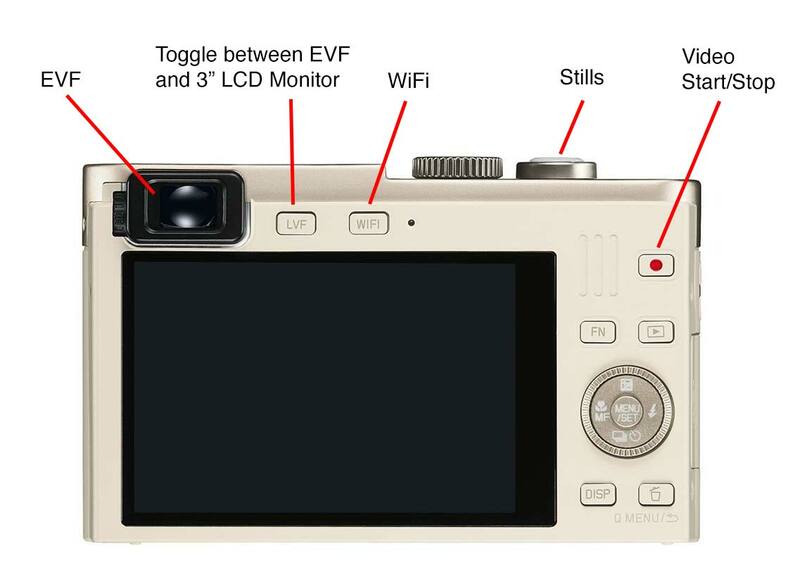 You can toggle between the elegantly integrated Electronic Viewfinder and the 3″ LCD display by pushing the LVF button on back. Fauer’s two rules of photography preclude calling something a camera if it has a ring tone or if you have to hold it at arm’s length. I had seen the pain of Leica executives watch in horror as their best friends and colleagues snapped away with smartphones. When asked why, the universal chorus was that a go-everywhere camera needed to be small, light, simple quick, pocketable or purse concealable–and of course a companion to the Leica M. The Leica C is all that. The Leica C’s Vario Summicron f/2.0-5.9 6-42.8 mm zoom is the equivalent of a 28-200 mm in 35mm format. It has a 1/1.7″ (approx 1/2″) CMOS 12.1 megapixel sensor. I got good results with the camera set to “P” exposure mode, with the front knurled ring controlling ISO. Food photography is enhanced by turning the the Mode dial to SCN (Scene) and selecting “Food.” Appropriately, the Leica C comes in Champagne and Burgundy colors. The camera is fast. Turn it on, and it’s ready to shoot in about a second. Autofocus is speedy, and the refresh time between shots is less than a second. It shoots 1920 x 1080 30p video at 20 Mbps (MP4 files) and AVCHD 60p 17 Mbps (among other rezzes and rates). Wi- Fi and Near Field Communication (NFC) enables remote control from a smartphone or tablet. It also lets you view images and watch videos in real-time on your smartphone. The body is by Audi Design. They also designed accessories, purses, pouches, cases, clutches, clips and clasps. The Leica C is available now. It comes with a free copy of Adobe Lightroom imaging software — which alone justifies the price. Excellent compact camera, fast high quality lens good size CMOS.